Come on in and take a look around. Click on any of the images below to see it MUCH bigger. 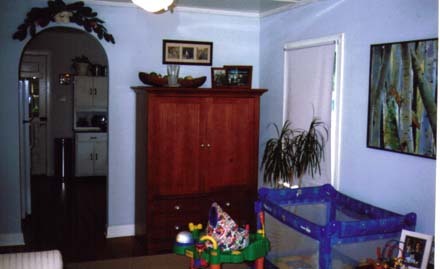 Note that the furniture that you see in these photos - especially the baby furniture - is from the previous owner and is NOT ours! The House from accross the intersection. Yes it's a corner lot. Behind the garage (far right) is the creek. Looking directly at the front door. Notice the "gingerbread" over the gable end. The front walk is made of loosely-bedded flat rocks (one of our many projects is to replace this and do more landscaping). When you walk in the front door you are in the living room. 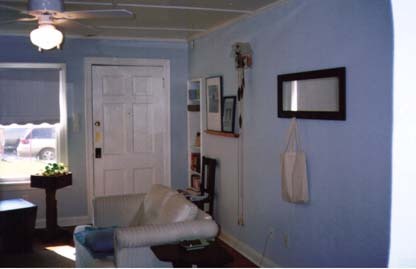 The doorways were "arched" during renovations in 1997. 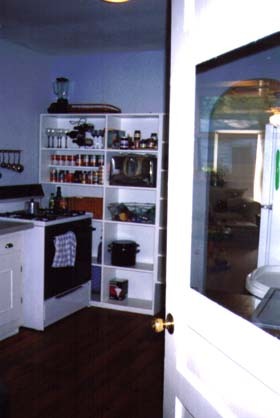 Looking left, you can see the arched doorways to both the kitchen (right) and bedrooms (left). Turning around and looking at the front door from the kitchen. We really like the bright light and natural wood floors. 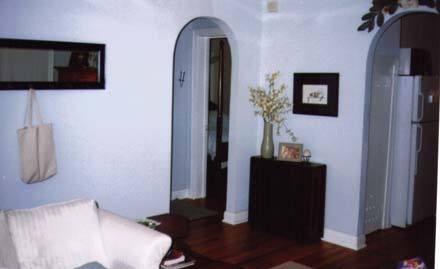 From this living room arched doorway, this is what the kitchen looks like. 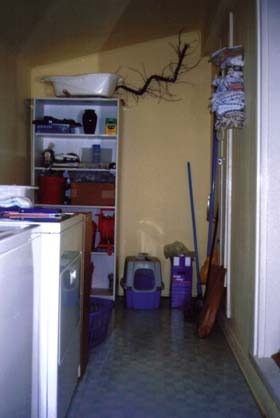 From the back of the house, standing in the laundry room, this is what the kitchen looks like. I don't know why, but many kitchens in Texas do not have hoods over the stove top. Ahhh...the bathroom. Not much to say about this except that it is the only one, it has a glass block window and features the all-important magazine storage shelf hiding behind the door. Every house needs to have a utility room for...well, utilities. 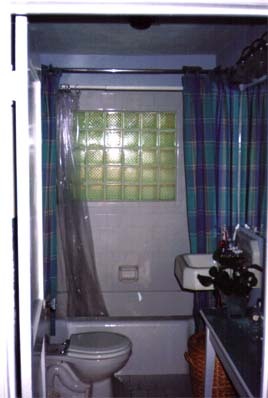 This one has a built-in, fold-down ironing board from the 1950's. Styling! 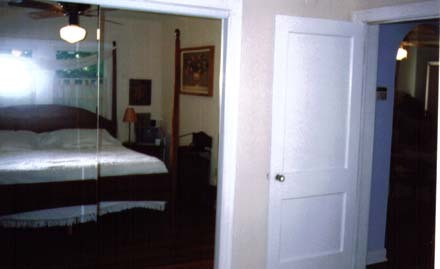 The master bedroom. 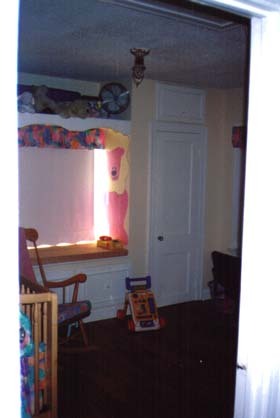 This picture is actually taken looking at the mirrors on the closet doors and reflecting back into the room. Our bed isn't this big. Legal Disclaimer: This page is not meant to discriminate anyone not hailing from the above mentioned states. This includes anyone currently - or formerly - residing in Wyoming, Texas or California. Residents of these states, as well as the state of "confusion", are eligible for the same benefits upon visition.